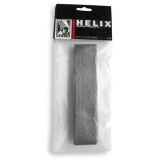 MotoManiac - Santa Cruz, CA, USA Helix Heat Shield "Works great to protect your expensive bodywork from the heat of aftermarket exhaust systems." Zukguy - NY Seems like a good product "Just applied this to the inside of a side panel after installing an aftermarket exhaust system. It was pretty easy to work with and seems to adhere well. Seems better quality than the heat shield that was included with the system. Time will tell."